If you’re still using Windows Vista, then you’ll want to upgrade soon or face a complete lack of technical support from Microsoft. April 11, 2017 ended Microsoft support for Windows Vista. That follows fully five years after the OS hit its end-of-maintenance support date of April 10, 2012, and roughly 10 years since Microsoft first released Windows Vista to a litany of complaints and its eventual replacement by the much well-received Windows 7. What this means is that Windows Vista will no longer receive any kind of update, including new security updates, non-security hotfixes, or free or paid support. Microsoft will also no longer provide any online technical content updates. In other words, if you’re intent on continuing to use Windows Vista — and there aren’t many of you who remain committed to one of the company’s least popular operating systems then you’re completely on your own. 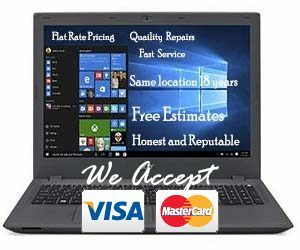 However Its been our experience that if your computer is running Vista it may be possible to upgrade to windows 7. We do not recommend upgrading a Vista machine to windows 10 as there is too big of a gap in hardware and you’re likely to have major issues. Bring your system in for a free evaluation and find out for sure what’s the best thing to do for your machine. If you are seeking windows 10, then it would be best to buy a new machine and retire your old system. If you have data on your old unit we will transfer your old data to your new machine for you, same day turn around.